Home Uncategorized Don’t mess with my nuggets! Don’t mess with my nuggets! Listening to a talk by “the bride of the revolution,” the unabashedly fanatical Chavista apologist Golinger, was going to be a serious test of my tolerance. Luckily, Eva’s presence did not materialize, but it did not make my experience any less painful. See, I spent much of Monday sitting in a well-lit, air-conditioned conference room overlooking the Caracas valley, surrounded by video screens and state-of-the-art sound equipment, watching the Gulfstreams of the revolution’s kleptocrats land in the middle of this traffic-congested city. The purpose? I wanted to get a first-hand experience of the revolution’s indoctrination and the effect it is causing. Yet painful as it was, what I learned was surprising, and I was happy Quico practically forced me to go. Last week, Roger asked me if I wanted to tag along to this event. It was called “The Third Engine of the Revolution: Morals and Enlightenment” (in Spanish, “Moral y Luces”, part of a famous quote of Simon Bolivar’s, identifying them as the country’s primary necessities). It consisted of a seminar on socialist indoctrination held by the government – at taxpayer expense, of course. Attendance was mandatory for the entire office. Roger’s bosses made sure the building where they work was locked up, lest anyone think of going to the office for work instead. Not knowing what to expect, I decided to tag along. The crowd included hundreds of employees from Roger’s office, from the maintenance staff to uniformed naval officers. The head captains of each and every Venezuelan port were seated in the first few rows, having flown to Caracas especially for the occasion – I had to wonder who was minding our ports if all the port captains were here. The first talk was from a man named Haiman El-Troudi. As I later found out, Mr. El-Troudi is an old communist workhorse from Barinas, the President’s home state, which has surely helped him rise to the top of the rankings of chavista “intellectual” nomenklatur. The talk was basically a retread of old Marxist principles I heard many times during my studies in public universities, where the nefarious “IVth Republic” gave these Marxists plenty of freedom to spread their ideas. But a few things sounded new to me. The laundry list of everything the Revolution supposedly “isn’t” but so clearly “is” made me chuckle. He also riffed on the new forms of private property, one being a brand-new “revolutionary” notion they like to call “Social Production Companies.” These companies are supposed to function as cooperatives supported by the government, but their design is still hazy because, according to Mr. El-Troudi, the employees participate in the decision-making process and their capitalist values lead them to think they are the owners or that they are the government’s partners, which they are clearly not. The speaker said this came up in negotiations with Sidor, a company partly owned by the workers. They are addressing this issue with the President, fine-tuning the system so that workers’ capitalist vices cannot find a way of expressing themselves. An intermission for a “beverage” was animated by a tambora group which, as Roger explained, was typical in Chavista seminars, always including some form of “cultural expression.” The dancers were quite skilled, and very provocative. Their movements, their attire – which left little to the imagination – and the beating of their drums reminded me of long-gone weekend nights in Choroní, but as you can imagine it did not seem appropriate for a seminar on political indoctrination held at a university. This, however, didn’t prevent some of the participants from joining the dancers in the ruckus. More talk followed, this time about education. The speaker, a mild-mannered professor of Education at Simón Rodríguez Experimental University, bored us to tears with tales of Rodríguez and how the Revolution’s educational project captures his ideals of inclusion and racial diversity in the schools. He mentioned that Rodríguez died in poverty, surrounded by his books, which made me question his concept of poverty since books must have cost a fortune in the XIXth Century. Although less controversial than the previous talks, the speaker’s tone made it perfectly clear that underneath his navy-blue sweater vest beat the heart of a true Marxist. Through it all, he did not bother to speak about increasing educational coverage, or the quality of the nation’s teachers, or the infrastructure of our public schools, or the lack of technology, just to mention a few of the pressing issues that make our current educational system a failed one. Only one person stood up. He identified himself as Marcos, a small-scale fishing entrepreneur from Apure in his late forties, whose European looks had been darkened over the years by the unforgiving sunlight of the Llanos. The speaker asked Marcos to hurry up and finish his question, to which he replied that he was forced to sit there for five hours, that his time deserved respect, and he was going to say his piece without being rushed. He spoke about how there are many environmental problems in the rivers of Apure, how the only infrastructure for fishermen was built by Carlos Andrés Pérez, and how he thinks that, no, it’s not heresy to acknowledge that and throw CAP a bone. In his straight-forward manner, he said he believed in the process and that he thought we should all let go of the capitalist values that made us, for example, want to go eat at McDonald’s or Tropi Burger. Marcos finished his speech asking how a revolutionary like himself can reconcile the need to let go of his goods while the revolution’s bigshots enjoy an excess of sudden wealth. Spontaneous applause broke out in the crowd, and my squalid jaw hit the floor. The speaker’s answer was that people succumb to the temptations of luxury goods because they have been programmed by capitalism for too many years – see, it’s not the crooks’ fault, it’s capitalism that made them do it. Ergo, the only way to get rid of corruption is to get rid of capitalism. In the meantime, he said that the only way to counter this is by enforcing “social comptrolling” or “contraloria social”, a catch-all phrase of imprecise meaning used by chavistas when they want to convince the people they are empowered in situations where they clearly aren’t. I didn’t want to attend this forum. Quite frankly, I was a bit scared to go, not knowing what I would find or even if I would be allowed in the building. I fully expected to go home in a state of depression and anxiety. With all the friends I have in Caracas, why waste precious time inmersed in revolutionary rhetoric? Imagine my surprise when I left feeling a renewed sense of optimism. See, the forum convinced me that chavismo’s internal contradictions are slowly coming to the surface. I spoke to other participants. One woman said she liked the talk, but she didn’t like the part about education because she didn’t want her kids exposed to a single doctrine. Another woman rolled her eyes when I asked her about the seminar, and told me she wouldn’t be there if they hadn’t forced her to go. The people in the forum were mostly lower-level employees from a particular public office. They may or may not be representative of chavismo at large, and while most of them do not have much formal education, they can sense the danger in the government’s Marxist rhetoric and values. Venezuelans from every spectrum like to earn money and enjoy spending it, just like everybody else. They want to work and build a better future for themselves and their kids, just like everybody else. 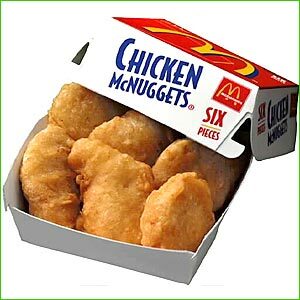 And yes, sometimes they like going out and buying themselves some McNuggets. The time will come when the madness of the Revolution will wake them up from their slumber, they will realize their lives are changing for the worse, and that liberty is worth fighting for. Who knows, they may even use “Don’t mess with my nuggets” as a rallying cry. Previous articleLaw of the Land: the DVD Commentary, Minus the DVD!